More than anything, Maya wants to go to New York for college to study filmmaking. Her parents want her to stay close to home, study to be a doctor, and meet a nice Indian boy. Maya can't think of anything she wants less. Then she meets Kareem. Maya's mother makes no secret of the fact that she likes Kareem and, in an unfamiliar twist, Maya agrees. She likes Kareem too. But then there's Phil, the boy Maya has had a crush on for years, who maybe has a crush on her too. Maya knows which boy she should want but that isn't always how things work. But just when Maya starts to figure things out, everything changes. A suicide bomber who shares Maya's last name attacks in a city far away but the shockwaves hit Maya and her family hard in their small town. Maya and her family face horrible prejudice in the name of revenge for something they had no part in and in the wake of someone else's tragedy all Maya's plans and dreams are turned upside down by her parents' fear. 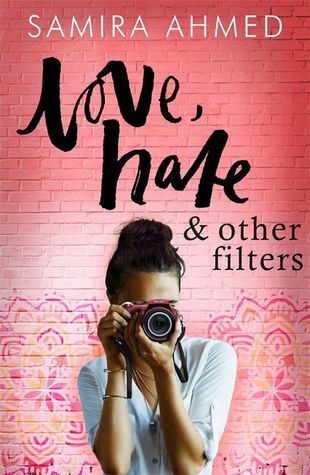 Love, Hate & Other Filters is really a book of two halves. It begins as a high school romance, with Maya trying to make the choice between Kareem, who her parents like and who understands what it is to be an American child of Indian parents, and Phil, who she has known forever and who her parents would never approve of for their daughter. It begins as the story of a girl who sees filmmaking as her life and her passion and whose parents see it as a nice hobby for her to have while she trains to be a doctor. It's a coming of age story, with Maya trying to make her own path and go after the life she wants and the person she wants to be, even against her parents' wishes. Then the terrorist attack happens and, just as these things do in real life, it completely changes the story out of nowhere. This is no longer a story about a girl trying to choose between two boys, it's now a story about a girl facing abuse for her religion and ethnicity from a boy at school who thinks that she deserves to be prosecuted for the actions of others. It's now about Maya's parents refusing to let her go to New York, not because they don't approve of her passions, but because they fear for her safety. The second half of Love, Hate & Other Filters is a heartbreaking story of prejudice and fear. The switch between these two halves is sudden and jarring. The reader sees some of the lead up to the attack but it still feels like a shock when it happens, and the fallout that Maya and her parents experience is truly upsetting. Maya's entire life is thrown out of balance because of the reaction of one boy at her school to this attack and it's hard and important to read about. It's easy to see that the jarring nature of the switch in tone makes a point about how these things come from nowhere, but at the same time, the message of this story may have been stronger if more time had been dedicated to the events after the attack, rather than spending quite so many pages on Maya's love triangle. It feels like a slightly missed opportunity that she has already pretty much made her choice between the two boys before this huge change happens in her life, although, of course the events after the attack do still have some bearing on the ultimate outcome. Nevertheless this is most definitely a timely novel, which makes some extremely important observations, and I would certainly recommend it.